Jack Russell Stadium is located at 800 Phillies Drive in Clearwater, Florida. For almost 50 years it was the spring training home of the Philadelphia Phillies. Constructed in 1954, the ballpark opened in 1955 when the Phillies moved their spring training home two blocks west from Clearwater Athletic Field. The Phillies had held their spring training at Clearwater Athletic Field since 1947. Jack Russell Stadium was also home to the Florida State League Clearwater Phillies from 1985 to 2003. The ballpark was named after Jack Russell, a former pitcher for the Boston Red Sox, Cleveland Indians, Washington Senators, Detroit Tigers, Chicago Cubs, and St. Louis Cardinals, who settled in Clearwater, Florida, after his 16 major league career ended in 1940. Russell helped spearhead the construction of a new ballpark in Clearwater to replace the outdated Clearwater Athletic Park. Jack Russell Stadium’s grandstand was built in the same mold as other Florida spring training ballparks of that era such as Al Lopez Stadium in Tampa and Fort Lauderdale Stadium in Fort Lauderdale. The grandstand was single deck, covered from first base around to third base. The press box was located behind home plate under the overhang. The grandstand included aluminum seats in the lower seating bowl and aluminum bleachers under the grandstand roof. In 2004, the Phillies left Jack Russell Stadium and relocated four miles east to brand new Bright House Stadium. In 2007, the grandstand and the ticket office was demolished. Metal bleachers along the first base line that had been installed at Jack Russell Stadium sometime after its original construction were preserved and still remain at the ballpark. The dugouts were preserved and remain at the ballpark as well. Metal bleachers located along the third base line were also preserved. The scoreboard and batters eye remain at the site. The original concrete block wall still surrounds the stadium exterior. Several administrative buildings also remain on site. Although the grandstand constructed in 1954 is now gone, much of the rest of the ballpark remains intact, allowing visitors the opportunity to appreciate Florida Spring Training from the 1950s and 1960s. Extra Innings Youth Foundation currently leases and maintains the ballpark. Extra Innings has “developed programs which include the introduction of baseball activities while simultaneously fostering academic improvement, spiritual guidance, and assisting young adults to become self sufficient in making life choices.” (See Extra Innings Website). Any Phillies fans who are interested in the history of their team and the game itself should take the four mile drive from Bright House Field west on Drew Street to the former site of Clearwater Athletic Field and the current site of Jack Russell Stadium. Over 55 seasons of Phillies spring training history occurred at those two locations and they certainly are worth a visit. Professional baseball first came to St. Petersburg, Florida, as early as 1908 when the then- independent St. Paul Saints played an exhibition game against the National League Cincinnati Reds. In 1914, businessman and future mayor Al Lang convinced the St. Louis Browns to come to St. Petersburg and train at Sunshine Park – also known as Coffee Pot Park because of its location near Coffee Pot Bayou in St. Petersburg. The Browns stayed in St. Petersburg only one season. From 1915 through 1918, the Philadelphia Phillies trained at Coffee Pot Park. In 1922, a new ballpark opened along the shoreline of Tampa Bay in St. Petersburg on a patch of land that was part of the city’s mile-long Waterfront Park. The ball field, also known as Waterfront Park, was located at the intersection of 1st Avenue S.E. and First Street S.E. It was the spring training grounds of the Boston Braves beginning in 1922. In 1925, the New York Yankees began training in St. Petersburg at nearby Crescent Lake Park, while playing some of their games at Waterfront Park. The Braves departed St. Petersburg after the 1937 season and the St. Louis Cardinals moved to Waterfront Park in 1938, sharing the facility with the Yankees for Spring Training games. In 1947, Waterfront Park was demolished and replaced by Al Lang Field, named in honor of the man who helped establish St. Petersburg as a spring training mecca. Al Lang Field was constructed on land one block south of the northern most point of Waterfront Park. Thus, the grandstand at Al Lang Field was built on top of Waterfront Park’s former infield. The exact location of Waterfront Park in relation to Al Lang Field is evident by comparing the two ballparks as they appear below in the two aerial postcards of Waterfront Park and Al Lang Field. As can be seen from the above two postcards and the postcard below, a parking lot for Al Lang Field was constructed where Waterfront Park’s grandstand once stood. In the city block just north of the parking lot is Pioneer Park, which honors St. Petersburg’s earliest settlers. In 1977, Al Lang Field was demolished and replaced by Al Lang Stadium, a concrete structure with little of the charm offered baseball fans at Al Lang Field and Waterfront Park. In 1998, the naming rights to Al Lang Stadium were sold and the stadium was renamed Florida Power Park. It later was renamed Progress Energy Park in 2003. The stadium complex currently is known as Al Lang Field at Progress Energy Park. The Yankees departed Al Lang Field for Fort Lauderdale after the 1960 Spring Training season and the Cardinals departed for Palm Beach after the 1997 season. Other professional teams that once called the ballpark home were the New York Giants (1951), the New York Mets (1962-1987), and the Baltimore Orioles (1992-1995). In 1998, the Tampa Bay Devil Rays took over the ballpark. The Devil Rays, a 1998 MLB expansion team, played their regular season games at the Tropicana Dome, located less than two miles west of Progress Energy Park. Although the concrete structure of the stadium itself leaves much to be desired, the setting at Progress Energy Park was one of the most beautiful of all spring training venues, current or former. The view of the playing field, with Tampa Bay as a back drop,wais breathtaking. Beginning in 2005, the Tampa Bay Rays began a campaign to build a new major league ballpark on the site of Progress Energy Field. However, those plans met public opposition and quietly were withdrawn in 2009. The Rays trained at Progress Energy Park through the 2008 season. In 2009 the Rays moved to a new ballpark in Port Charlotte, Florida, 80 miles south. Charlotte Sports Park previously had been the home Spring Training home for the Texas Rangers. The park was renovated prior to the Rays arrival in 2009. The facade of Progress Energy Park includes a series of plaques which in 1998 had been part of the “Jim Healey and Jack Lake Baseball Boulevard.” The 85 brass home plate plaques that made up the Baseball Boulevard told the story of Major League baseball St. Petersburg. One of the plaques honors the opening of Waterfront Park in 1922. However, the plaque states, incorrectly, that Waterfront Park was located on land that later became Bayfront Center, an indoor sports arena built in 1965 and demolished in 2004. The former site of Bayfront Center is now the Salvador Dali Museum, which is located south of Progress Energy Field on Bay Shore Drive. Progress Energy Park is still used to today, mainly for minor league soccer and music concerts. Although St. Petersburg residents appear to favor keeping the site a public park, it seems only a matter of time before the stadium itself is demolished. Hopefully, the historic field will be maintained, for it represents over 90 years of baseball spring training history. 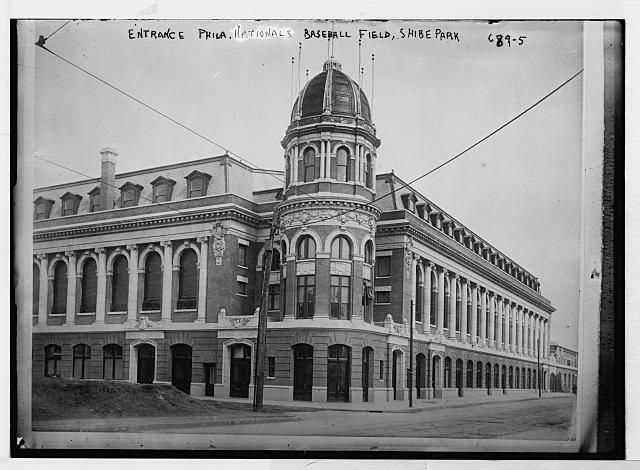 Shibe Park (later known as Connie Mack Stadium) was home to both the Philadelphia Phillies and Philadelphia Athletics and was located three miles north of Center City Philadephia and only five blocks west of the Baker Bowl. Although the ballpark was demolished decades ago, a state historical marker now marks the spot. The Deliverance Evangelistic Church now sits on the former site. Although the ballpark itself no longer remains, buildings in the area help provide prospective for where the ballpark once stood. Surrounding the mega-church are many of the same row houses that once caused Connie Mack to build a spite fence in right field along North 20th Street to keep fans sitting on rooftops across the street from watching the games for free. Those same row houses can be seen in this photograph of the 1914 World Series. Connie Mack’s spite fence atop the right field wall arrived in 1935. As with the Baker Bowl, a trip to the corner of Lehigh and 21st Street is well worth the stop for any baseball fan who appreciates the history of the game. 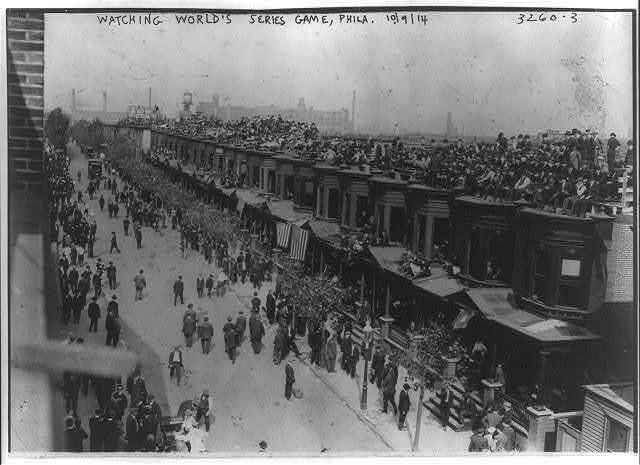 Looking at the houses along 20th Street, one can still imagine their rooftops packed with fans watching the proceedings of the 1914 World Series. A statue of former Philadelphia A’s owner and manager Connie Mack stands adjacent to the parking lot outside Citizens Bank Park. The statute originally was located in a park across the street from Connie Mack Stadium on Lehigh Avenue and was placed there as a tribute to Mr. Mack soon after his death in 1956. When the Phillies moved to Veterans Stadium, the statute moved with them, where it sat outside the Vet until the stadium’s demolition in 2004. Shibe Park/Connie Mack Stadium closed during the 1970 season. Fans leaving the final game grab souvenirs of the old ballpark. The ballpark was demolished in 1974. The Philadelphia Phillies called the Baker Bowl their home from 1887 to 1938. Demolished a decade later, nothing now remains of the ballpark, although a state historical marker notes its former location. Some of the buildings surrounding the site from that era do help provide perspective of how the ballpark once fit into the neighborhood. The warehouse (former Brooks Brothers warehouse?) that looms over the outfield in the postcard above remains. The warehouse also is visible in this vintage 1932 photograph of former New York Giant third baseman Gil English. The warehouse also is visible along Lehigh Avenue. The Moore & White Company (which made machinery such as paper machinery) was located at northeast corner of 15th Street and Lehigh Avenue, just beyond the left field bleachers (as seen in the photograph below). That building is no longer at the site. Also remaining at the site from the time of the Baker Bowl is a two-story brick building (now painted white) topped with billboards that is visible in pictures of the stadium just beyond right-center field. The Baker Bowl site now is occupied by a gas station and parking lot that sit in left and center field respectively. A two story International-style industrial building sits in the former location of the infield and right field. The buildings on the south side of Huntingdon remain from the time of the Baker Bowl as well. Is the former site of the Baker Bowl worth a visit, even though nothing remains of the former ballpark? If you are a fan of the Phillies and appreciate the history of the game, it is worth a stop, especially since the distinctive v-shaped warehouse that once loomed over center field remains in place. Another former ballpark worth visiting is the Phillies’ second home – Shibe Park – which was located just a few blocks west of the Baker Bowl at the corner of Lehigh Avenue and North 29th Street. More on that lost ballpark later.